Flotilla Passengers Huwaida Arraf of Free Gaza Movement and Retired Army Col. Ann Wright Respond to Israeli Claims on Deadly Assault | Democracy Now! co-founder of the International Solidarity Movement and chairperson of the Free Gaza Movement. She was on the Challenger 1 boat. Speaking from Ramallah. Retired Army colonel and former US diplomat. She spent twenty-nine years in the military and later served as a high-ranking diplomat in the State Department. In 2001 she helped oversee the reopening of the US mission in Afghanistan. In 2003 she resigned her State Department post to protest the war in Iraq. She was on the Freedom Flotilla and was just deported to Turkey. staff attorney at Adalah, the Legal Center for Arab Minority Rights in Israel. She interviewed many of the activists in detention. JUAN GONZALEZ: The bodies of nine activists killed by Israeli troops on the Gaza aid flotilla arrived in Turkey Thursday morning. The Anatolia news agency reports that eight of the dead were Turks and one was a US citizen of Turkish origin. Turkish forensic experts have confirmed that all nine were shot with guns. Some 450 of the remaining activists have also arrived in Turkey after being released from Israeli custody. Most of the activists were flown out of Israel with no belongings other than their passports and clothes. A crowd of several thousand gathered in central Istanbul to celebrate the activists’ return. Meanwhile, three air ambulances landed at a military base in Ankara carrying wounded activists who were transferred to hospitals in the city. Officials in Israel say they have released about 700 activists from forty-two countries that were seized from the Gaza aid flotilla. Seven activists wounded in the Israeli attack are reportedly still being treated in an Israeli hospital, while three others — an Irishman and two women from Australia and Italy — remain in Israeli custody. Ha’aretz reports that there are also still a number of Israeli citizens in detention. AMY GOODMAN: Meanwhile in Israel, Prime Minister Benjamin Netanyahu dismissed criticism of the raid by Israeli commandos on the humanitarian aid flotilla in international waters as “hypocrisy.” In a televised address, he said the Israeli soldiers had acted to defend themselves. His comments came as the UN Human Rights Council voted to set up an independent international inquiry into the raid. Meanwhile, talk is now turning to the next ship on its way across the Mediterranean to try to break Israel’s blockade of Gaza. The ship is named The Rachel Corrie, after the American peace activist who was crushed to death by an Israeli military bulldozer in 2003 when she was trying to protect the home of a Palestinian family from demolition. About eleven people are onboard, including the Irish Nobel Peace laureate Mairead Corrigan Maguire. Huwaida Arraf is the chairperson of the Free Gaza Movement. She was on the flotilla when it was attacked. She was released from Israeli custody Tuesday. She joins us on the phone from Ramallah in the West Bank. Huwaida, welcome to Democracy Now! Can you talk about the latest developments and also what the Prime Minister had to say? We’re trying to reach Huwaida Arraf right now on the line. Let us go back for a moment, though, to another guest that we have on the line. Sawsan Zaher is a staff attorney at Adalah, the Legal Center for Arab Minority Rights in Israel. She has interviewed many of the activists in detention, joining us on the phone from southern Israel. Sawsan, what have you learned from those hundreds of people who were imprisoned? Who did you talk to? What were their stories of what happened onboard the flotilla? SAWSAN ZAHER: Yeah, well, first of all, good day to everyone. I just would like to emphasize that before we even succeeded to meet with the activists, we had a long journey full with obstacles from the Israeli authorities. We knew about the first sixteen detainees that were in Israeli custody and detention that were taken already on Monday, and already when we knew about that, we started to apply in order to meet them, and we were all the time refused. When we knew that they arrived, that all the flotilla or most of the flotilla have arrived to Ashdod, a port, I also went there and also asked to meet the detainees, because they of course have the right to meet a lawyer in order to inform them about their legal rights, etc. I was also refused. The argument then was that the whole port for this action was a closed military zone, and no entrance was allowed. AMY GOODMAN: — and it’s very difficult to get her. So I just wanted to go, Huwaida, to you, as you were in this aid flotilla. Describe what happened to you and the people you were imprisoned with, the stories that you heard, and now what’s happening with the ship that is coming in, another part of the aid flotilla. HUWAIDA ARRAF: Sure, I’ll tell you what I can. Thank you for having me, Amy. ship, which is the American flag vessel, and we were one of six ships that were on the flotilla. At approximately midnight, the Israeli navy started radioing us, asking for information, which we supplied to them, as to who we are, what flag we were flying under, where we came from, where we were going. Then they started issuing threats against us, demanding that we turn around and saying that they would be willing to use all necessary force in order to enforce the blockade on Gaza. To this, we replied that the blockade is illegal, and we are unarmed civilians, we are carrying only humanitarian aid, and therefore they would not be justified in using force against us. And we urged them over and over again not to use force against us as we continue on our way to Gaza. A few hours later, while it was still dark, approximately 4:00, 4:30 in the morning, we saw their naval vessels quickly approaching just around our vessels. On our ship, we had approximately seventeen people, five of them which were American citizens. We all went outside, because we had planned to try to prevent them from boarding our ship as best as we can just using our bodies. Going outside allowed me to see the beginnings of the attack on the Turkish ship, the Mavi Marmara. We were traveling very close alongside it on its left side. And I saw Zodiacs filled with armed commandos coming up upon the ship, then heard explosions, which I take to be tear — sorry, concussion grenades or sound bombs. And then there were — opening fire. And because we didn’t have any guns or weapons on our ships, fire came from the Israeli commandos. There was also a helicopter overhead. As far as the people on the ship, I could see them at first try to use just water hoses to keep the Israeli soldiers back, but that’s all I was able to see before our ship decided to take as fast as we could. Although we had initially agreed that we would all stay together and help each other, the captain of the Marmara told us to go on ahead and try to radio out, try to tell the world what was happening, that we were under attack. So we put our boat in full speed and tried to prevent or at least delay them boarding our ship. Unfortunately, we could not get any word out, because our satellite communications systems were jammed. So after about fifteen — ten or fifteen minutes or so, they were able to surround our boat and proceeded to board it. We tried to put our bodies in the way. We repeated that we’re on an American flag vessel, we are unarmed civilians, don’t board. They had masks and guns, and they proceeded to violently board. They threw concussion grenades onto the boat. They used tasers on people and then, in general, just beat people down that tried to put themselves in the way. We had — we tried to prevent them from getting inside the boat. They broke the glass doors to get access to the wheelhouse. Anyone that stood in the way, they just beat them down. A young Belgian volunteer ended up with a bloody face. Just to give you an example of how they treated us, you know, they grabbed me by the hair and rammed my head into the deck and then were stepping on my head in order to cuff my hands behind my back and then put a sack over my head. And this is the kind of violent treatment that we were subjected to, as Israel says that, yeah, they were as nonviolent as possible and they were the ones under attack. They immediately went for any kind of media recording equipment, telephones, cameras, that we had and confiscated those, and then proceeded to do their own recording, which I’m presuming is the only recording that’s coming out from their takeover of the ship. JUAN GONZALEZ: Huwaida, I’d like to ask you, because this has been such a bone of contention and the Israeli government has so vehemently denied it, the issue of the first explosions that you heard on the main boat. Did those occur before any Israelis had actually landed on the boat? HUWAIDA ARRAF: Yes, yes. You know, we had someone on watch all of the time on our boat just to see when they would start approaching. And so, as soon as we got a call that their naval vessels are coming, we went outside on the deck of the boat, and so I saw the Israeli — the Zodiacs approaching the Marmara, then they were up against it, and immediately heard explosions. This was before — you know, this was almost immediately after we heard that — or we saw them approaching, so they really didn’t have time to enter before we heard these explosions, not only concussion grenades, but opening of fire. I can’t tell you for sure if it was rubber-coated, steel bullets, live ammunition — I’m not quite sure — but there was definitely an opening of fire before they boarded the ship. AMY GOODMAN: And Huwaida, when did you hear that people onboard the main ship had been killed? HUWAIDA ARRAF: This wasn’t until much later, after we were pulled into the port of Ashdod. We protested even leaving the ship. We told the Israeli soldiers that we consider ourselves kidnapped. We were attacked in international waters. We were still seventy miles out from the coast of Gaza and nowhere near Israeli territorial waters, and we did not want to go to Israel. And so, they picked us up by our hands and feet one by one. Some people walked, but others were dragged off of the boat. And then we were separated. So I didn’t see any of my colleagues after that. They put me through different levels of interrogation. And it was one of the officers that told me that there had been casualties. At that point, we didn’t know how many, and we still actually are trying to ascertain the whole truth about how many and who. AMY GOODMAN: We understand from Turkish media nine dead. Eight of them lived in Turkey, one of them a US citizen. Is that your understanding? HUWAIDA ARRAF: Yeah. Yes, that is the latest information that I have. We’re still following up on it to verify, but that is the latest information that I have. And, you know, it’s worthwhile to say, because I know Israel’s spin machine is working and they’re trying to say that we were violent and the casualties were all our fault, but a few things. One, they were the initial aggressors. Two, they didn’t have to attack, because they knew we constituted no threat to them whatsoever. We kept repeating that we told them we were unarmed civilians. We told them that we had been checked at the port that we departed from. And we told them also that we would be willing to submit to additional checks by a neutral body, whether it be the UN or the ICRC. We weren’t hiding anything at all. And therefore, there was absolutely no justification in using this kind of violence against us. I mean, they sent out armed commandos to attack unarmed ships carrying only aid headed for the Gaza Strip. JUAN GONZALEZ: And Huwaida, the issue of how they have treated the Israeli citizens that were on the boats, apparently in an even harsher way than they have with the international folks that were on the boat, do you have any information on that? HUWAIDA ARRAF: Yes. Well, I know that they did try — moved to prosecute four of the Palestinians with Israeli citizenship, one of them a young lady, Lubna, who — an organizer with the Free Gaza Movement. They stuck them — charges against them, use of violence and other things. But I think they — one, either they recognized that eventually these charges would not hold, the same way that they tried to say that we had weapons on our boats and later they retreated from these claims because there were no weapons on our boats, the same way charging these four with using violence would not have held. And at the same time, there was a sense of solidarity amongst all of the people that were engaged in this mission, and therefore people that were detained and knew about the charges being pressed against these four refused to leave the country until these four were released. Yesterday, actually, there was a big demonstration at the airport, mainly the Turkish activists that refused to get on planes until they found out that the Palestinian citizens of Israel had been released. And they were supposed to be released as of this morning. AMY GOODMAN: In the United States, the big question that’s being asked by the media, those that are covering this, is why you didn’t allow them to check to see what this humanitarian aid was. And in Sharif Abdel Kouddous’s interview with the Israeli deputy ambassador to the United Nations yesterday that we played, he said that they could go on these ships in international water, the ambassador said, because if there is a threat, there is — they are able to do that, that it is legal. HUWAIDA ARRAF: [inaudible] never even asked to board and check our ship. What they offered is for us to give them the cargo and that they would deliver it to Gaza. And the response to this is twofold. One, it’s really disingenuous for them to say that, because they know that the cargo that we were carrying is precisely the cargo they have not allowed in Gaza for over three years, and yet they consist of only basic supplies that are desperately needed in Gaza, such as a water filtration systems, books for universities, paper for schools, reconstruction supplies, prefabricated homes. They don’t let these items into Gaza or through what they call their humanitarian corridor. Israel’s blockade on Gaza is so comprehensive and only meant to keep Palestinians basically on the verge of survival or so that one cannot say there’s actual starvation, but it is not a life. They have reduced Gaza to a situation where over 80 percent of the people are in need of humanitarian aid, and Israel trickles in this humanitarian aid. So we are not interested in perpetuating this cycle. We need to campaign for an end to the policy that leaves Palestinians in need of humanitarian aid, and therefore we not only need to just deliver the aid through negotiation with Israel, we need to end this policy so that Palestinians can have access to the outside world, so that they can import and produce and export and build an economy and be able to lead a life with dignity, instead of just living off of handouts. And so that’s very important to recognize. So them letting the — taking the cargo and letting it in would not have worked for two reasons: one, they wouldn’t have let this cargo in; and two, it’s really about the policy that needs to be changed. AMY GOODMAN: Huwaida, was there discussion on the boat, among the passengers, about any kind of resistance to the commandos? Did you anticipate the commandos’ reaction onboard, their actions? HUWAIDA ARRAF: Well, we had agreed as a coalition. We had a few organizing meetings before we actually launched the flotilla. And as the organizing body, we had agreed that we would not resist with any kind of force. We would try to defend our boats as much as possible, mainly using our bodies. And we did agree that also using water or water hoses would be OK to try to keep them away, but that we would not — one, we would not have any kind of weapons on our boat, and two, that we would not use physical force to repel them. On our boat, it’s exactly what we did. We tried to put our bodies in the way. We were beaten up for it, but we did not respond by physically assaulting the soldiers. I wasn’t on the Marmara at the time of the attack, so I can’t actually say what went down there, though I wouldn’t be surprised if some people, you know, didn’t stick to the agreement amongst all of the coaltion or the organizing members. I mean, you had a situation where a boat of 560 people, most people we had given a training and orientation, but yet, in the middle of the night, you had commandos opening fire on your boat and descending on your boat from above. People might have felt like they had to fight back. But they fought back not really with the weapons or guns, because Israel had those, and they are the ones that launched the initial assault. So this attempt to vilify some people that might have picked up chairs or whatever to defend themselves, I think, is quite misplaced. JUAN GONZALEZ: And what about the issue that apparently some of the folks also brought children with them and the criticism that — again, that the Israeli government has launched of putting children in such a dangerous situation? HUWAIDA ARRAF: I spent a couple of days on the Mavi Marmara when our boat had a little bit of technical problems, and there were no children except for one. The first mate of the Marmara had brought his wife and young son onboard, and they were basically the whole time in the captain’s quarter. Generally, you know, the crew captain, first mate are allowed, you know, under international law, to bring their families with them. Whether or not it was a wise decision, I don’t feel like I can comment on. But aside from that family and that one child, there weren’t other children on these boats. AMY GOODMAN: And Huwaida, the image that is shown in the video of what is described as the commandos being attacked by men with bars or sticks, it’s not clear. HUWAIDA ARRAF: Like I said, it’s hard for me to comment, because I wasn’t on the boat when it happened, but two things that make me a little bit — that call this into question. One is that we — I saw how they treated us on our boat. We didn’t have sticks or anything like that, and yet they were very violent, and they immediately went to remove any kind of recording equipment that we had. So any of the footage that we took was all gone. And then they proceeded to make their own videos. So I would doubt the authenticity of it. But let’s say we don’t doubt the authenticity of it, and some people did use bars or whatever they had. Again, we have to go back to the fact that Israel launched the initial attack, and they started firing on the boat before the soldiers even descended onto the boat. And while we, you know, had an agreement as a coalition that we would not fight back using any kind of physical resistance, sometimes you can’t control people’s — how people react to violence, and it may have happened. But the people that did defend themselves in this way shouldn’t be the ones that are vilified or condemned, because Israel knew that they were launching this heavy attack against unarmed boats and unarmed civilians. I don’t know what they — they expect that people would just welcome them onto the boat after they fired in this way and they were masked? They did not lift the masks off their face once. They were carrying M-16s and other weapons. I don’t know what they expected. So it’s really Israel’s policy that is to blame for the casualties that happened. AMY GOODMAN: And finally, the ships that are moving forward now, with Denis Halliday, the former assistant UN Secretary-General who had been in charge in Iraq — he is on the ship — the Nobel laureate Mairead Maguire, they are moving forward toward Gaza. What’s the plan? HUWAIDA ARRAF: Yes, that is on the Motor Vessel Rachel Corrie, which was always designed to be a part of the flotilla. However, it had some mechanical problems, in addition to another boat that was supposed to be part of the flotilla and had some mechanical problems. They were delayed, unfortunately. At first, we did not want to say we suspected sabotage, but we weren’t saying anything, just trying to deal with the situation. [inaudible] two days ago, Israel actually bragged about the fact that they engaged in sabotaging our boats. But nevertheless, that’s not going to hold them back. We were able to deal with it, the MV Rachel Corrie, and she has been sailing. She is in the Mediterranean now, with the personalities that you mentioned onboard. However, we, as an organization and as a coalition, are now assessing the most strategic time and way to have the Motor Vessel Rachel Corrie approach Gaza. We are dealing with the casualties and the results of the attack on the last flotilla and want to make sure that this one is protected and documented as much as we can and that it has all the political support that we can muster to ensure success. 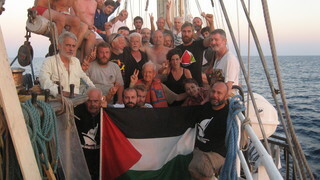 So while it is ready to start the voyage towards Gaza and probably be in Gaza within one or two days, we might actually end up holding it back until we can garner more support to ensure that what happened with the last flotilla doesn’t happen to the MV Rachel Corrie and the vessels that are to follow, because now there is widespread outrage and people ready to donate more boats and more cargo so that we keep up this effort, this international civilian effort, to break the siege on Gaza. So, we will try to keep you updated as much as possible. AMY GOODMAN: We want to thank you, Huwaida Arraf, for joining us. Huwaida Arraf is the founder of the International Solidarity Movement and chairperson of the Free Gaza Movement. She was part of the Freedom Flotilla that was heading to Gaza when the Israeli commandos landed and attacked. This is Democracy Now! We’ll be back in a minute. AMY GOODMAN: We continue to talk about the aid flotilla. Juan? JUAN GONZALEZ: Well, we also have on the line also someone else who was on that boat. Ann Wright is a retired Army colonel, a former US diplomat. She spent twenty-nine years in the military and later served as a high-ranking diplomat in the State Department. In 2001, she helped oversee the reopening of the US mission in Afghanistan. In 2003, she resigned her State Department post to protest the war in Iraq. She was on the Freedom Flotilla and just deported to Turkey. AMY GOODMAN: Colonel Wright, welcome to Democracy Now! ANN WRIGHT: Hi, Amy, Juan. AMY GOODMAN: Can you tell us what happened to you? ANN WRIGHT: Well, I was also on the Challenger 1 with Huwaida. And let me just give a great compliment to Huwaida and all of the Free Gaza Movement. It’s a tremendous, tremendous thing that they have done in creating this movement of boats that had six large vessels that went toward Gaza. And let me tell you how thrilling it was to see all of those boats steaming, those civilians trying to challenge the governments of the world that say there must be a siege to strangle the 1.5 million people in Gaza, and yet the citizens of the world are challenging that with everything they’ve got. JUAN GONZALEZ: Tell us what you saw and how you were treated by the Israeli soldiers. ANN WRIGHT: Well, I saw the attack on the Marmara also of the helicopters coming over, the rappelling down of the soldiers, the sailors, the Zodiac boats coming up the side, the spraying of them. Then, with that, the captain of the Marmara told us to go ahead to try to get as far away as we could, because we had the fastest boat. We were — as Huwaida very accurately described, our boat was boarded. People were thrown on the deck. Windows were blown out. Flash bangs were used. One of our journalists was hit with something of an electric shock. I don’t know that it was a taser. She doesn’t know, either, yet. One of the women was hit in the face, in the nose, with one of the liquid-filled balls. They were very excessively rough, excessively forceful, on trying to slow down, stop — actually, we were already stopped. They weren’t stopping us at all. We were already dead in the water, and yet all of this force used on us. AMY GOODMAN: Colonel Wright, I wanted to get your response to Vice President Biden. He was on the Charlie Rose show last night, and he was questioning what the big deal was getting this humanitarian aid directly to Gaza. This is the Vice President. AMY GOODMAN: That was Vice President Biden last night. Colonel Ann Wright, your response? ANN WRIGHT: Well, I think our vice president needs to take another look at this thing. The ships were open to inspection beforehand, and I’m quite sure Mossad had their little agents that were all over that place. These groups are humanitarian groups that are bringing in goods that are needed for the people of Gaza. They’ve had plenty of inspections on them. If you talk about violence, it’s not 3,000 rockets Hamas is putting on Gaza; it’s a twenty-two-day attack that the Israelis did that killed 1,400 people, wounded 5,000, left 50,000 homeless. And here we are a year and four months later, and the Israelis will not let any sort of reconstruction materials in. And then, when reconstruction materials start coming that way, instead of waiting until — if they have a zone that they are trying to protect, let ships come into it and stop them. But I would say that there are ways that you can stop them without killing people. There are ways you can stop even passenger ship like that ferry boat, and certainly like our little thirty-foot craft. You don’t have to use commandos with — I mean, you can use commandos with excessive force, which they do, but there are other ways to do it, if you want to kind of preserve a sense of civility, humanity, and meeting the international law, quite honestly. And going outside a boundary, going into international waters, I mean, what they are are pirates. They are pirates. They kidnap people, and they’re stealing stuff. They’ve probably stolen over a million dollars’ worth of cameras, computers, cell phones. I mean, I’m in Istanbul. We just got here early this morning. Some luggage is here. There’s not a thing in it. Everything has been taken. The Israeli military said, “Oh, yes, we have to count this. You know, we have to take it.” Well, what they’ve done, they’ve stolen it. And if we have any friends that are in Israel, I hope that they go down to the black market and see where our stuff is, because somebody is making a killing on this thing. JUAN GONZALEZ: And Ann Wright, once you were in Israeli custody, how were you and the other prisoners treated? ANN WRIGHT: Well, in the brand new Israeli prison — nobody had ever been in this particular prison in Barsheba that we were in — the treatment was reasonable. However, when we got out to the airport, I have never seen supposedly professional law enforcement people treat others with such disrespect. They were laughing, giggling, commenting on wounded and dead. It was a very pitiful, pitiful performance by law enforcement people. And I think what we saw as internationals coming in there is the tip of the iceberg compared to what Palestinians see every single day from those types of law enforcement officials. AMY GOODMAN: Colonel Ann Wright, we want to thank you for being with us, speaking to us from Istanbul, where she was just deported to. She is a retired US Army colonel, former US diplomat, spent twenty-nine years in the military, later served as a high-ranking diplomat in the State Department. In 2001, she helped oversee the lead-up to — in 2001, she helped oversee the reopening of the US mission in Afghanistan, in 2003 resigned her State Department post to protest the war in Iraq. She was on the Freedom Flotilla, as was Huwaida Arraf.